Beautifully handmade and handpainted under the glaze stoneware dishes from Buchan Portobello Scotland. The background colour is a beautiful sky blue and the pattern is a thistle amidst heather and bluebells. 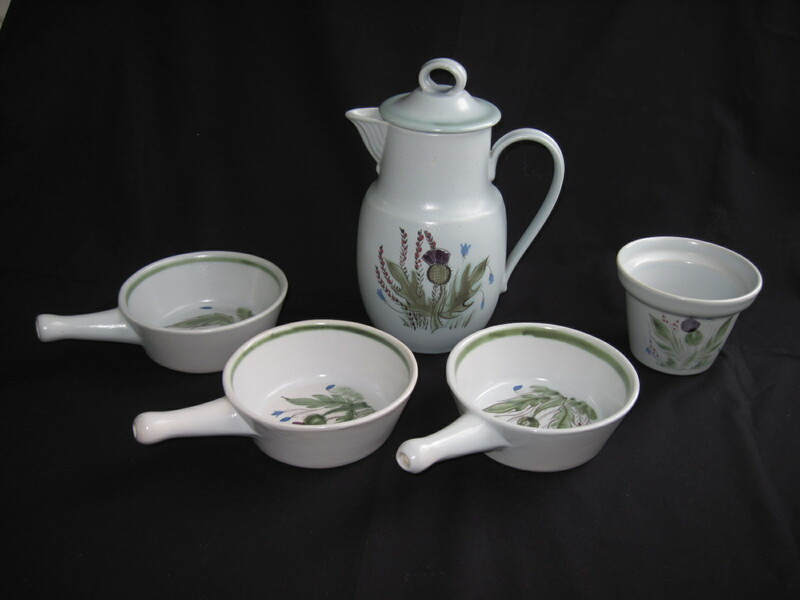 The thistle pattern was the most popular of the Buchan Portobello Company patterns, to the point where the goods were known as Thistle ware from 1946 on. In 1949 the thistle trademark was officially registered and the works were known as the Thistle Pottery until the company closed in 1972. The company relocated to Crieff from Montebello and continued with the Thistle pattern and a few others until its closure in 1999. Apparently the company was registered again and survived with one lone potter and a single decorator who continue to make the Thistle pattern to this day. Tags: 1950's, A, buchan portobello, Buchan Portobello Company, Buchan Portobello Scotland, buchan scotland, Crieff, mid century dishes, stoneware, thistle coffee pot, Thistle pattern, Thistle Pottery, thistle soup bowl, thistle ware, W. Buchan & Co. 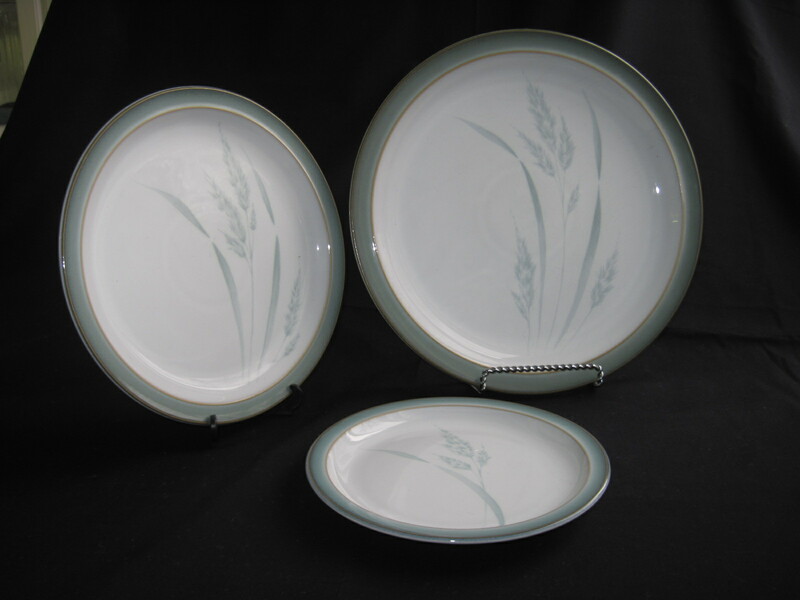 These are very nice, subtly patterned Denby plates, in the Regency Meadow pattern produced between 2002 and 2006. This pattern compliments their Regency Green one which is the same colour scheme, with no pattern in the center. There are 8 dinner plates and 7 lunch plates and 7 side plates. The dinner and lunch plates show utensil marks and wear, but no major scratches. The sides are in excellent condition. These will be for sale at my booth at the Almonte Antique Market, 26 Mill Street, Almonte ON. Priced at $8 each dinner plate, $6 each lunch plate, and $ 5 each side plate. Please note these dishes are now SOLD!!!! 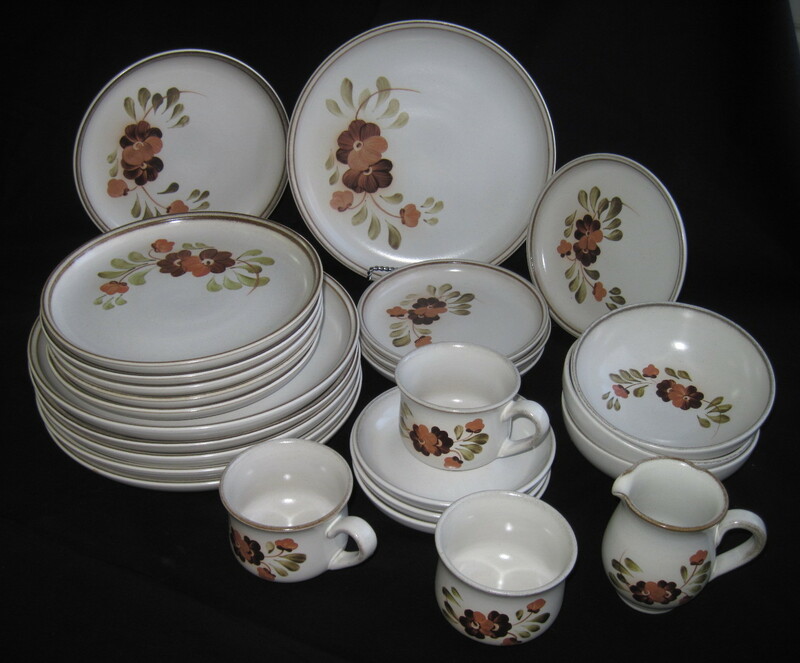 This set of stoneware dishes was produced by Denby sometime between 1976 and 1982 when the pattern Serenade was discontinued. This is an incomplete set: 6 dinner plates, 6 lunch plates, 4 side plates, 3 soup bowls, 2 cups and 3 saucers, creamer and sugar. The creamer is chipped on the outer lip but I couldn’t bring myself to toss it. It is still functional. The dishes are in very good condition, with some minor utensil marks. Surface glaze is still nice and shiny. The individual pieces will be sold on ebay soon. Made in Hong Kong, probably mid 50’s to early 60’s. Just the right size to fit your lipstick and kleenex. In nice condition with all beads intact. Brass coloured closure and serpentine style chain handle. For sale at my booth at the Almonte Antique Market, 26 Mill Street, Almonte ON. 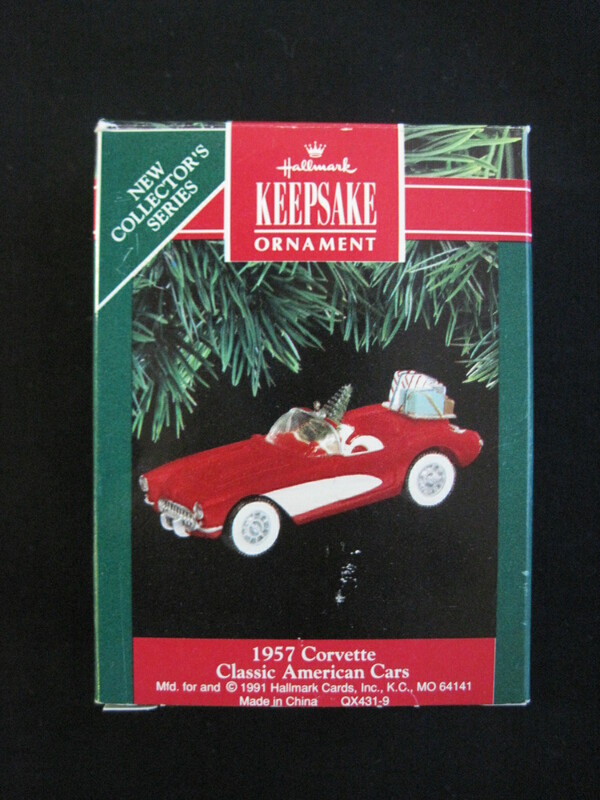 1957 Corvette Hallmark Keepsake Ornament, First in the Classic American Cars Series. Copyright date 1991. Handcrafted. Authentically modeled after the original classic. Box is in decent shape, some minor scuffing on the back. 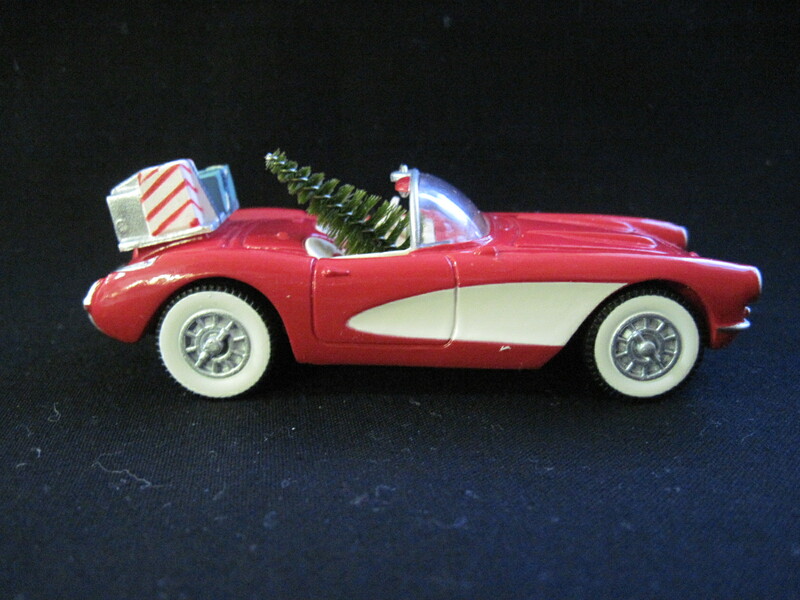 Ornament in very good unused condition. 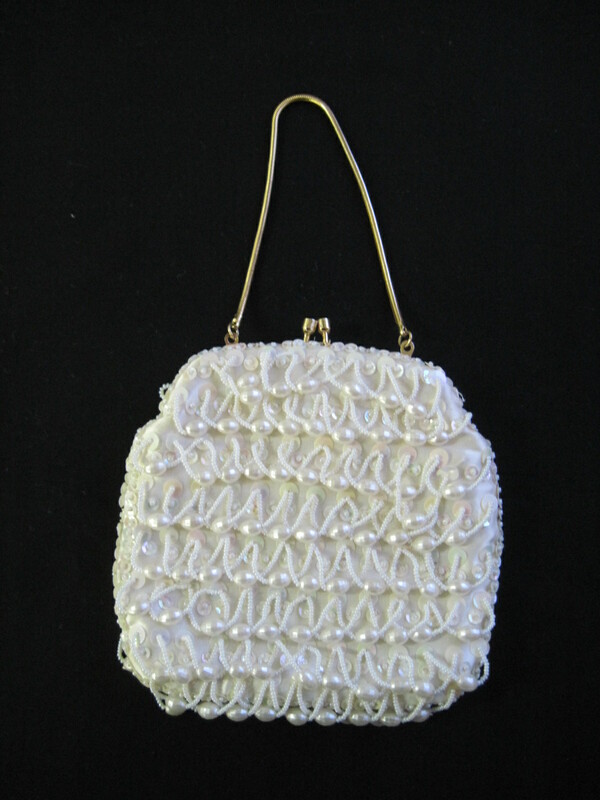 I love all things designed by Vera. These plates make a statement!! 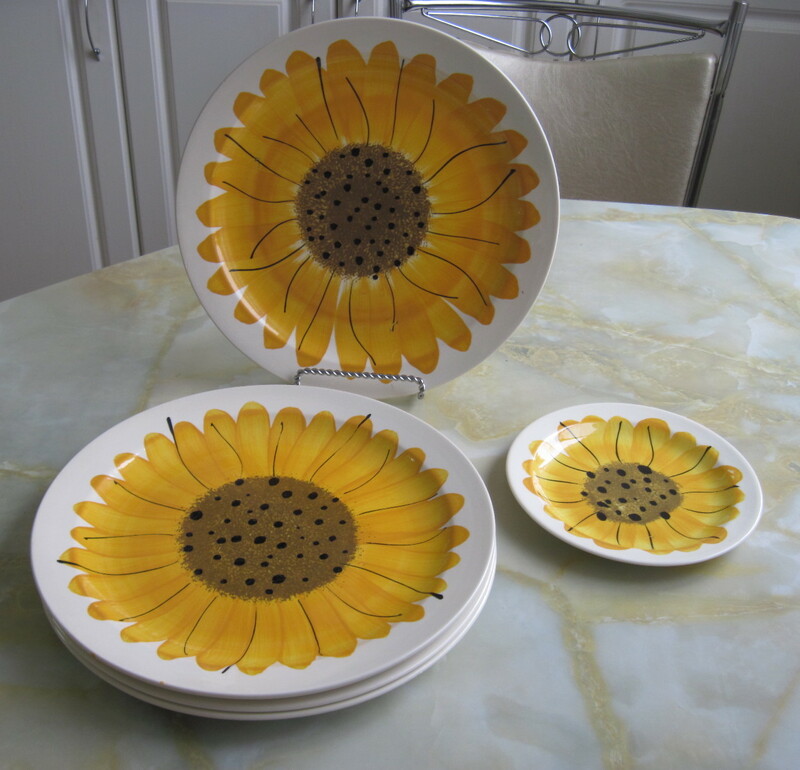 They are the Sunflower pattern designed by Vera Neumann for Island Worcester. All handpainted under the glaze, in Jamaica ca. 1960’s. I have at least 10 dinner plates available. They will be for sale at my booth at the Almonte Antique Market, 26 Mill Street, Almonte ON. Priced at $10 each dinner plate and $ 6 each side plate. Please note all these dishes are now SOLD!! 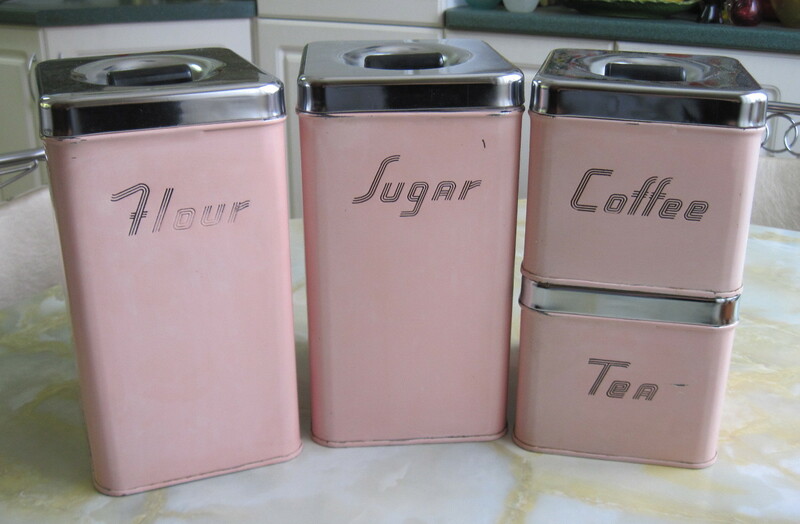 Straight out of a 1950’s kitchen, this lovely pink canister set has some wear to the titles on the tins but otherwise in very nice vintage condition. Insides are fairly clean with some minor erosion along the lower edges. Outside surfaces have some slight scratches and paint loss. Lids are in good condition. Please note this set is now SOLD!!!! Priced at $45 for the set.